I am often asked what to do if a spouse is not behaving as a grownup. Does this mean the case has to become contested and ugly? Not necessarily. There are a number of strategies that have worked with my clients. If my client can be the grownup we can resolve the matter in an amicable fashion. First, try to have a meeting. I invite the other party to meet with my client and me. Often the person wants to “save face” by acting like a grown up in front of me. He/she will explain how logical their position is and why things should go his/her way. I always listen, pointing out that listening is not agreeing. This is not the time to attack the opposing side’s position. That will only result in push back. I want the person to feel heard. Then I may ask questions or present my client’s position. The key is to listen. I am amazed at how much I can accomplish by listening. At this meeting, we try to make a determination if we can work together cooperatively. The majority of the time we actually can. I make it clear that the opposing party is free to consult an attorney or even seek representation. Leaving that back door open is important. There are times where the opposing party is obstinate and clearly has no interest in being cooperative. At that point, I ask the opposing party to seek his/her own counsel. I explain to my client that this is not necessarily a bad thing because then I have a grownup to talk to. I advise my client that we will know a lot more about how the case will go after I find who they hired. Mean nasty people like to hire mean nasty lawyers. If that happens, we do not have a cooperative case and we proceed as necessary. An important point to remember is that even if a case is very contentious, it will probably not go to trial. Fewer than 1% of divorce cases actually go to trial. There are a lot of steps along the way and almost all cases settle somewhere before trial. If the case does become contentious, there is no reason you need to be contentious. 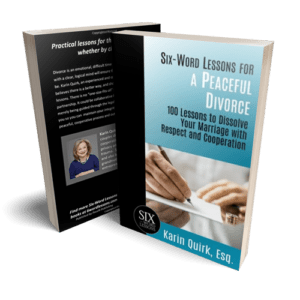 Fighting fire with fire is not a very good approach when it comes to divorce. Then you both get burned. Yes, a divorce can be negotiated even if only one of you is the grown up.